Aufheben, 'What was the USSR?' Part I: Trotsky and state capitalism; Part II: Russia as a non-mode of production; Part III: Left communism and the Russian revolution; Part IV: Towards a theory of the deformation of value. Linda Cook, The Soviet Social Contract and Why It Failed; Welfare Policy and Workers’ Politics from Brezhnev to Yeltsin. Cook shows how the Soviet elite kept power not just with repression but by offering concessions to contain the Soviet working class. Michael Cox,'The Cold War as a System'. Cox convincingly shows how Stalinism and the Cold War helped stabilise global capitalism for 40 years. Donald Filtzer, Soviet Workers and Stalinist Industrialization: The Formation of Modern Soviet Production Relations, 1928-1941, and Soviet Workers and De-Stalinization: The Consolidation of the Modern System of Soviet Production Relations, 1953-1964. Filtzer puts the issue of labor discipline at the very heart of his understanding of the antagonistic relationship between the Soviet elite and its work force. Marcel van der Linden, Western Marxism and the Soviet Union. The most comprehensive summary of the various theories of the nature of the Soviet Union. Jeffrey Rossman, Worker Resistance under Stalin; Class and Revolution on the Shop Floor. A detailed account and analysis of cotton workers' strikes in 1932, examining class, gender identity politics in Stalin's Russia. 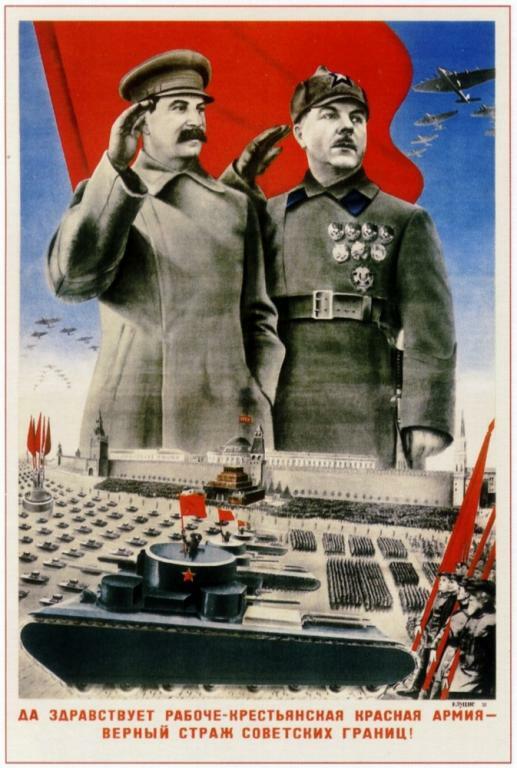 The book is summarised here: 'Strikes against Stalin in 1930s Russia'. 'The Political Economy of Class in the Transitional Epoch', Critique No.20-21. In these classic articles, Hillel Ticktin went beyond all previous Marxist understandings of the Soviet Union which tended to crudely squeeze the complexities of the chaotic Soviet system into preconceived categories such 'state capitalism' or 'degenerated workers state'. Lynne Viola, Peasant Rebels Under Stalin: Collectivization and the Culture of Peasant Resistance Includes a chapter on women's riots against collectivization: 'Peasant Women's Protest during Collectivization'. Wikipedia on Joseph Stalin for introduction to debate on the number of Stalin's victims. Simon Clarke, Simon Clarke shows how industrial relations in Russian workplaces have changed since the Soviet collapse. What about the Workers? Workers and the Transition to Capitalism in Russia. The Workers' Movement in Russia. Trade Unions and Industrial Relations in Post-Communist Russia. The Development of Capitalism in Russia. Stephen Crowley, Hot Coal, Cold Steel. Crowley shows how struggles by miners were central to the story of the Soviet Union's collapse. Donald Filtzer, Soviet Workers and the Collapse of Perestroika: The Soviet Labour Process and Gorbachev's Reforms, 1985-1991. Soviet industry was plagued with high labor turnover, absenteeism, heavy drinking, and slow work which all encouraged the system's eventual collapse. The argument is summarised here: 'Labor discipline and the decline of the soviet system'. Hillel Ticktin, Origins of the Crisis in the USSR: Essays on the Political Economy of a Disintegrating System. The argument is summarised here: 'Theories of Disintegration of the USSR' and updated here: 'Political Economy of a Disintegrating Stalinism' Critique Vol.36. David Mandel, Labour After Communism. Another very useful book on relations between workers and bosses since the Soviet Collapse. Julie Marie Bunck, Fidel Castro and the Quest for a Revolutionary Culture in Cuba. Bunck may well be a right-winger but she is very good on the popular opposition to Castro's often over-praised regime. Jeffrey Kopstein, Chipping Away at the State: Workers' Resistance and the Demise of East Germany. Kopstein argues how the everyday resistance of East German workers could wear down a despotic state over four decades until it was eventually overthrown. The book is summarised here: 'Workers' resistance and the demise of East Germany'. Harold Lydall, Yugoslavia in Crisis. Lydall integrates Yugoslavia's experiments in workers' self-management into his analysis of the decline of the regime created by Tito. Daniel Kelliher, Peasant Power in China, The Era of Rural Reform, 1979–1989. Like Thaxton, Kelliher uses James C Scott's 'anarchist' ideas of 'everyday resistance' to understand the Chinese peasantry. Ching Kwan Lee, Against the Law, Labor Protests in China’s Rustbelt and Sunbelt. Lee's book is a brilliant history of the recent changes in the Chinese workplace. Elizabeth Perry: is a good social historian of the history of the Chinese working class. Challenging the Mandate of Heaven: Social Protest and State Power in China. Pun Ngai, Made in China: Women Factory Workers in a Global Workplace. Ralph A. Thaxton, Catastrophe and Contention in Rural China: Mao's Great Leap Forward Famine and the Origins of Righteous Resistance in Da Fo Village . Wikipedia on Mao Zedong for introduction to debates on numbers of Mao's victims. Life has improved, comrades. Life has become more joyous!"